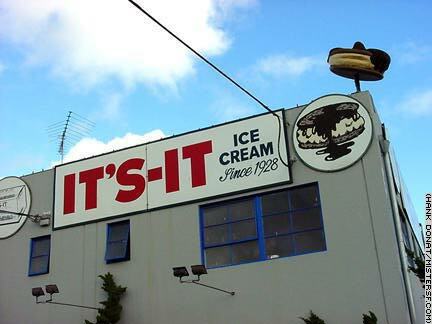 The It's-It is the real San Francisco treat. This epicurean wonder, a confection of vanilla ice cream sandwiched between two oatmeal cookies and covered with chocolate then frozen, was invented in 1928 by amusement park owner George Whitney. Whitney wanted something special for a refreshment stand at his Ocean Beach attraction, San Francisco's historic Playland at the Beach. The It's-It was it. Playland operated its midway, bumper cars, rifle range, fun house and more for over fifty years before closing in 1972. By then the park had long since lost its luster. The rickety roller coaster, The Big Dipper, had been torn down twenty years earlier. In addition to the packaged It's-It, other remnants of the Playland era have endured including the Musée Mechanique and Camera Obscura at the Cliff House, the historic Charles Looff carousel now at the Zeum children's center in Yerba Buena Gardens, and the hanging-by-a-thread Doggie Diner mascot on Sloat Blvd. Extra! Information for ordering It's-It bars.